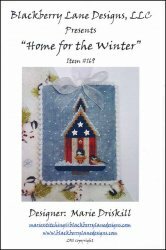 Home For The Winter [E1184] - $12.00 : Yarn Tree, Your wholesale source for cross stitch supplies. Cross stitch pattern by Blackberry Lane Designs. Two chickadees have made a home for the winter in a patriotic themed birdhouse. Snowflakes fill the sky. Stitch count 52w x 71h.